My daughter wanted to be a mummy Bride, so I found a white dress, and sewed gauze and spiders to it. Then to give it the aged look, I got brown fabric paint and brushed it onto the dress and the gauze. Then for the veil, I bought see through material and sewed it around a headband, sewed spiders and brushed it with the paint. 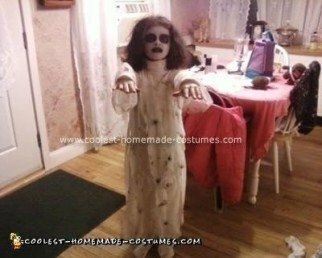 For the finishing touches of the Homemade Mummy Bride Halloween Costume, we painted her face black and white, and sprayed her hair with black and white hair spray.